Louisiana’s coastal swamp forests are sinking. Can dredge spoils stop them? 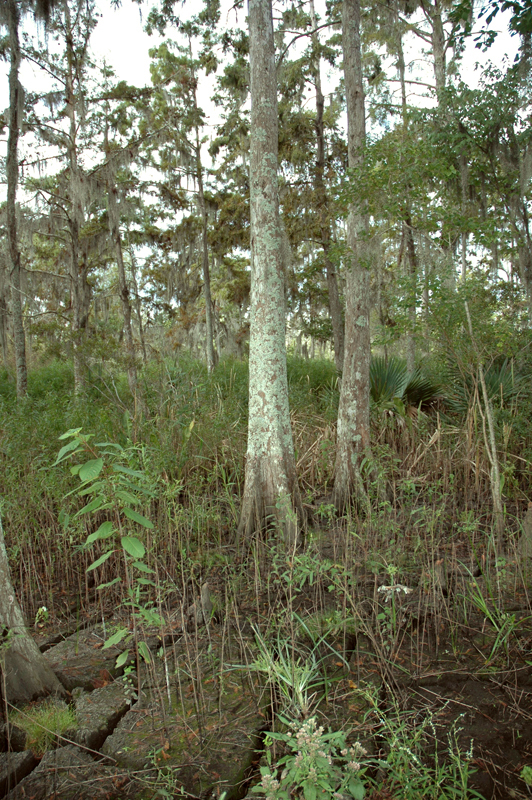 Like many of Louisiana’s coastal wetlands, the bald cypress swamp forests within the Jean Lafitte National Historic Park and Preserve are sinking. Explanations for the submerging swamps and marshes include sea level rise, the hydrological effects of channelization and canal-building, and even shifting faults beneath the wetlands. One tactic for keeping these important habitats above water is to dredge sediment from nearby waterways and spread it across threatened wetlands, bolstering the elevation and allowing vegetation to take root. That was the intended effect of a 2009 sediment application in two Jean Lafitte National Historic Park and Preserve bald cypress swamp forests. But while these “sediment amendments” have proven effective in saltwater and brackish marshes, the method was untested in this type of freshwater forest, Middleton said. “I think it’s not only is it an unusual project, but also there are literally no studies of it,” she said. At the request of the National Park Service, Middleton and her colleagues have spent the past four years studying the effects of the sediment application to the wetland forests. The most recent study of the project was published online by the journal Ecological Engineering in March. Middleton was well suited for the job because she was already working on a project monitoring the effects of climate change on wetland habitats across the Southeast U.S. The researchers first needed to know was how much sediment was applied to the swamp. Before the dredge spoils were brought in, Middleton and her colleagues set up a sediment elevation table. That requires driving a metal rod into the soft sediment of the wetland. One goal of sediment amendments is to revitalize a sinking wetlands’ vegetation, so the researchers analyzed the study site’s seed bank and tree growth. The seed bank, a measure of the seeds lying in a habitat’s soil, was particularly important in this case because the new layer of sediment had the potential to bury the seeds and prevent them from growing. A comparison of the test site’s seed bank to an off-site forest’s soil suggests that’s what happened here. Though some saplings popped up in the years after the application, many were maple and willow trees. Those weren’t the target species for this swamp, Middleton said, but they might still help slow the submerging wetland. “An argument can be made that those species, since they were growing pretty well, might actually add to the elevation of the place as it sinks,” she said. The new sediment didn’t appear to boost growth of the forest’s mature trees either. Though the trees did show extra growth in 2010, Middleton suspects that was the result of an effort to mitigate the effects of the Deepwater Horizon oil spill on the Gulf Coast. Extra water was released from the upstream Davis Pond from May to September that year to help push encroaching oil away from shore. That extra water, and not the sediment amendment, is likely what gave the trees a leg up. Middleton is in the process of authoring another paper on the effects of the water release. She said people will likely debate for years to come about whether that was a good idea.